"Who spins the elaborate web that entraps the timid spirit?" This is a fictionalized beginning biography about Chilean poet Pablo Neruda who became a Nobel prize winner. As a boy, Neftali Reyes (his real name) was extremely shy, timid, and sensitive - not the strong boy his father hoped would one day become a doctor or dentist, or even businessman. His overbearing father continually belittled him and left Neftali questioning his inquisitive nature and passion for words and the natural world around him. Luckily, he was surrounded by a supportive, though meek, mother and an uncle whose more humanitarian views toward the indigenous people and nature help Neftali shape his opinions, Unfortunately, these views drew the attention of an extremely suppressive government to both uncle and, eventually, Neruda. The text is beautifully accompanied by black and white illustrations by Peter Sis. One thing I appreciated about the book was that is showed Neruda as a questioning boy, but also an obedient one who respected his father and tried his best not to embarrass him. Even if we don't agree with his parenting skills, his father's actions are well-intentioned, and although Neftali is pretty sure in his gut that he will not be a doctor ("How did Father know what Nefali would become when he did not know himself?") and he knows he will continue to write poetry in college despite his father forbidding it, he finds a way to do so in a way so as not to humiliate him. Large print and illustrations will be encouragement for reluctant readers. Recommended for readers in grades 4-8 who enjoy biographies, or who are also dreamers. It's a slow book without a lot of dialogue and action, but full of emotion. An author's note is included providing more information about Neruda, as well as some of Neruda's poetry. I absolutely loved this book! Eleven-year-old Melody was born with Cerebral Palsy. Unable to walk, talk, or do just about anything for herself, she is often misunderstood by doctors, teachers, and other children as also having mental disabilities. But nothing could be further from the truth. In fact, Melody is actually quite brilliant, not that she is able to let anyone know. But her mother knows that she is not deficient and fights for her daughter to remain out of a mental institution and be included in classes at school. Still, Melody is frustrated listening to the same nursery rhymes and alphabet letters repeatedly. She is tired of not being able to answer questions in class like the other students. She is about to go out of her mind. 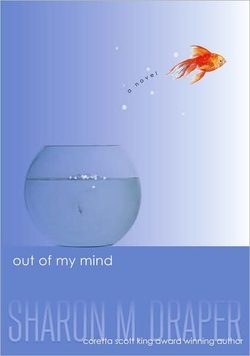 She has a limited vocabulary she can access on the board she keeps on her wheelchair, but it cannot help her when her goldfish jumps out of his bowl, or when her newest teacher doesn't review the last teacher's notes about Melody enjoying books-on-tape. Only when a fellow classmate shows up at school one day with a new laptop does it suddenly occur to her that she needs a computer too, a special one that she can operate with only her thumbs. Once Catherine, her helper at school, understands her desire, they search and locate the "Medi-Talker" that finally allows Melody to communicate. As she and her next-door neighbor Mrs. V. program the machine to include thousands of words and phrases, Melody is finally able to participate better in her classes, and begin to change the opinions of her teachers and classmates, though not without resistance and disbelief. Melody eventually qualifies for the academic team and is beyond ecstatic when her team is chosen to head to the national competition in Washington D.C. But don't believe for one minute that this will have a fairy tale ending. This is both a hopeful and heart-breaking story highly recommended for readers in grades 4-8. 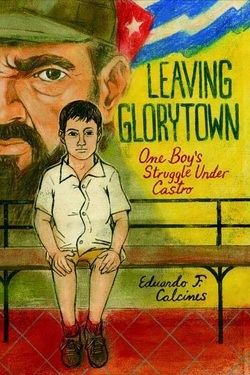 This is a captivating biography from the point of view of a young boy who experiences the changes to Cuba and it's citizens as Fidel Castro and communism take over the island in the early 1960's. Even as a 4-year-old, Eduardo notices the changes happening around him - the soldiers lined up on every street corner, the Voice on the radio, and especially the strange way his parents are acting. His father realizes immediately that the family must leave their home if they want to ever experience freedom again, not an easy decision considering their extremely large extended family surrounding and supporting each other. After applying for exit visas, which are awarded through a lottery, Eduardo's father is taken away to a work labor camp as a dissenter. In school, being a dissenter means daily bullying from his teachers and fellow students. Luckily, Eduardo has three close friends to defend him, including two who try to be loyal communists but who also don't believe the propaganda they are taught. As the months and years pass, Eduardo's family continues to believe that the military Jeep will drive up to their door with the telegram telling them that they will be able to leave. Time is running out, though, as Eduardo approaches 14-1/2 when he will be considered too old to leave and drafted into the army. Reading about Eduardo's story, complete with food rationing, tormenting by government thugs, and the complete loss of the most basic liberties such as public gatherings to play cards makes the reader appreciate better the problems associated with communism and the luxuries we often take for granted here in the United States. Even seemingly small things like chewing gum, comic books, and ice cream have been removed from Cuban experience. My only criticism of the book was the way the background information provided at the beginning was not incorporated into the story very well. It would have worked better as a prologue, starting the story in the second chapter when the revolution begins. Recommended for readers in grades 5 and up who might be interested in the Cuban revolution or political themes. I stand close to the door. I feel like a total goofball. 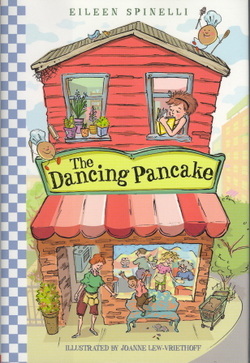 The backdrop of the story is the opening of a cafe called "The Dancing Pancake", operated by sixth-grader Bindi's mother and aunt. Following the departure of her father, who leaves town to look for a job, it becomes necessary for Bindi and her mother to move to an apartment over the cafe. The heart of the story, though, are the customers Bindi meets and the people hired to work at the cafe. Lots of secondary characters and subplots are woven effortlessly into the story including her best friend Albert, the bug-crazy and down-to-earth neighbor who provides stability and advice when needed, Ruby Frances, the young waitress who Bindy regrettably accuses of stealing money from the register when it comes up short, Jackson, a preschool cousin, and Grace, an elderly homeless customer. Bindi, who has been self-absorbed during much of the story does reach some closure by the end which will satisfy readers. Written in verse and reading like Bindi's personal journal, the story uses a multicultural cast of all ages to cover tougher issues like homelessness and separation of parents. Black-and-white line drawings interspersed throughout the book add humor and will entice younger readers. The short poetry makes it easy-to-read and would be an excellent choice for reluctant readers. Recommended for grades 3-6. I found this one hard to put down. 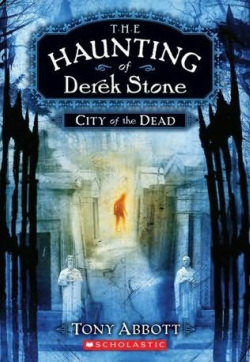 City of the Dead, Bayou Dogs,The Red House, and The Ghost Road are titles in this new series starring 14-year-old Derek Stone in the city of New Orleans. A train wreck leaves Derek's older brother Ronny and father dead, having been thrown off a bridge. Derek survives along with a girl named Abby who sat across from him on the train. Several weeks later Ronny returns home with an apparent memory loss, and things become even stranger after he visits an old, blind jazz musician late one night. The musician informs Derek that Ronny is not his brother at all, but Virgil Black, a young soldier he knew from 1938 who also happened to die in a train wreck at the exact same spot that Ronny did. Further, Derek learns that Virgil has returned from the other side through a tear that separates the two worlds and is using Ronny's body to fight others, with evil intent, who are reentering this world the same way. This begins the wild adventure Derek, Ronny, and Abby embark upon through the swamps and battlefields of New Orleans to fight the "Legion" and close the "Rift" before the "Grand Return" begins. This series will appeal to readers in grades 4-8 who enjoy fast-paced adventures and lots of ghosts. It is not especially scary as much as it is a mystery for the good guys to solve before the bad guys take over the world. The covers are enticing. Each book is a manageable length and with the low reading level, this is a great choice for reluctant readers. The ending leads me to believe that there might be more adventures in the future for Derek Stone, or is it Ulysses? Mammoths and Mastodons lived on earth for millions of years before suddenly becoming extinct. A newly discovered frozen baby mammoth above the arctic circle in Siberia has helped scientists answer questions about how these animals may have lived, and what similarities they may have had to modern elephants. If these questions can be answered, perhaps elephants can be helped from disappearing as well. This subject is cleverly discussed using game show tactics and having the reader imagine they are filming a documentary. Fans of dinosaurs and all things of the Ice Age will enjoy poring over the photographs, maps, graphs, and illustrations, while older readers will appreciate the higher vocabulary. The never boring text is accompanied by a glossary, index, and references for further reading. 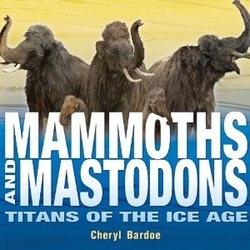 The library owns many books on mammoths, but this is the first that provides information on mastodons. Recommended for readers in grades 4-8. This graphic novel is a sequel toRapunzel's Revenge. Jack, from the familiar "Jack and the Beanstalk" fairytale, stars in this story starting with the tiny bean that begins all his misfortunes. Set in a much more current time and place, Jack's intentions are always to help his mother and to make her proud. Unfortunately, Jack is laden with bad luck, and being somewhat of a rebel-rouser, must escape from a band of angry giants to the American west where he meets up and becomes quickly enamored with Rapunzel (Rapunzel's Revengehappens at this point). 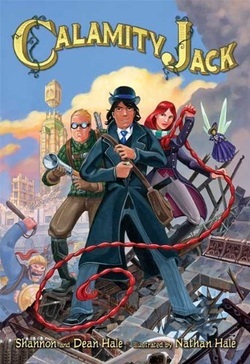 It seems her braids come in very handy in what turns into an action-packed adventure where Jack attempts to redeem himself and save his mother back in his home city of Shyport. The large format with expressive, vibrant artwork will appeal to fans of the format in grades 4-8. Fractured fairy tale lovers will also appreciate the humor and witty dialogue. Set in 1928, 10-year-old Nathaniel is living with his governess, Miss Lumpton, when a lawyer informs them that Nathaniel's parents' airship crashed on the ice in the North Pole. Their bodies were not among those found. While Miss Lumpton will receive "a tidy sum", Nathaniel will now go to live with his last surviving relative and beastologist, Phil A. Fludd, who it turns out is his aunt. Prevented from joining his parents on previous adventures, Nathaniel is unprepared to join his aunt on her current trip to Arabia to watch the hatching of a phoenix. Nevertheless, she insists that he is long overdue to begin his Fludd training as a beastologist and hoists him into her propeller plane. Excitement ensues when something becomes clogged in the propeller as they fly high above the ground toward Arabia and Nathaniel is sent outside the relative safety of his seat to remove the hazard. Here he finds a gremlin named Greasle hiding out in the propeller along with her brother Oiliver. Oiliver, unfortunately, gets thrown overboard before Nathaniel realizes what is clogging the propeller. Not to worry. Oiliver has big feet and will land just fine, assures Greasle. Camp is quickly set up in Arabia following a camel ride to the specific oasis where the phoenix is expected to live out his remaining moments before bursting into flame. But almost as quickly, Aunt Phil is taken away by the local Bedoins, leaving Nathaniel alone with a gremlin to ensure that the ashes of the phoenix don't burn out before the bird is able to rise again. 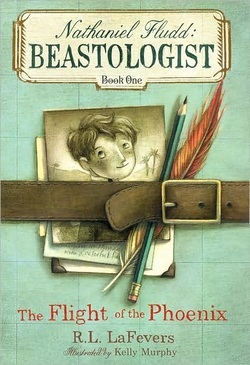 This is the first book in a series about the newest Fludd in a long line of Fludd beastologists. Readers in grades 3-5 will enjoy this, as will younger children who may hear it read aloud. The Pizza and Pages group enjoyed this book and several astute listeners were able to pick up on clues scattered throughout the story that will undoubtedly reappear in subsequent books. Black and white illustrations are included to help young readers visualize the characters and location. Also, a glossary is provided at the back of the book. "The first time you share tea with a Balti, you are a stranger. The second time you take tea, you are an honored guest. 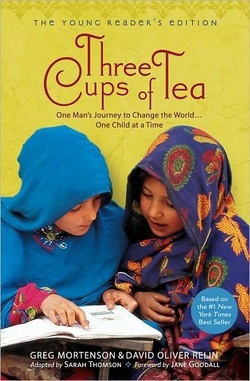 The third time you share tea, you are family, and for our family, we are prepared to do anything, even die." While returning from a failed attempt to climb K2, Greg Mortenson became lost in the Pakistan mountains, eventually arriving in the village of Korphe. After months of mountain climbing, he was nursed back to health by Haji Ali, the village chief who Greg would eventually promise to repay by building a school. He had noticed during his recovery that the children sat outside in the cold doing their lessons using sticks dipped in mud. He faced many adversities while trying to fulfill his promise, including no money to buy supplies, corrupt individuals trying to keep his supplies, no way to get the supplies across the river to Korphe, no labor to help build the school... but each obsticle found a solution leading "Dr. Greg" to find his life's work of building more schools for areas in Pakistan and Afghanistan where there had been none. This adaptation of the adult bestseller does not lose its impact on the reader. The hardships he and his family face everyday, including death threats and even a kidnapping, add to the appeal of the story. I found it hard to put down. This edition includes a timeline, glossary, who's who, and discussion questions that might be used by parents or teachers who wish to talk further about the book. Updated photos are included, as well as an interview with Greg's 12-year-old daughter, Amira. Highly recommended for readers in grades 5-8 (older readers can move on to the original book) who are interested in other cultures, volunteer work, charity, and helping to promote peace by providing education to those who are excluded from its luxury. This book is truly inspirational, and the man who began with nothing to accomplish everything that he has deserves to win the Nobel Peace Prize, in my opinion. This shouldn't be missed. This book is the first in a series written by multiple authors. 14-year-old Amy and 11-year-old Dan Cahill join their Cahill relatives following the funeral of their beloved grandmother Grace to learn that their family is one of the most powerful in human history, and that almost every famous person from the past has a connection. All family members attending are given a choice: one million dollars or the first clue to restore the family's power. Eight teams form and choose the clue... Amy and Dan, gorgeous cousins Ian and Natalie Kabra, Madison, Reagan, and Hamilton Holt along with their parents, Mary Todd and Eisenhower, who all look like G.I. Joe figures, teen star Jonah Wizard and his father, old Alistair Oh from Korea, former spy Irina Spasky from Russia, and the Starling triplets, Ted, Ned, and Sinead who resemble an Ivy League lacrosse team. The first clue reads "RESOLUTION: The fine print to guess. Seek out Richard S_____." With little trouble, all teams decipher this clue linked to Benjamin Franklin (who knew he was part of the Cahill clan?) and begin the race to solve the Cahill family mystery. Fast moving action, clues, and not a little family back-stabbing makes this adventure hard to put down. Math, geography, history, and science are also intertwined in the stories allowing kids to learn something without even realizing it. This will appeal to readers in grades 3-6 who enjoy mysteries, suspense, and solving puzzles, and boys especially will gravitate toward this series. 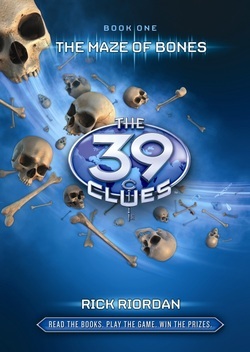 A related website is full of additional puzzles, information about the books, and author interviews that shouldn't be missed at www.the39clues.com. One additional puzzle kids will want to solve is the extra clue hidden in the misnumbered pages of the book....hint a=1. Winner of the 2010 Batchelder Award, this book is the second in the Children of Crow Cove series. Readers who enjoyed "Crow Girl" (reviewed here in February) will not be disappointed in this sequel. 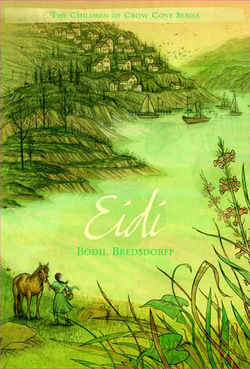 Eidi, the young girl who Myna had brought back home with her in the first book, is the protagonist in this story. It is a few years later and Eidi's mother has just given birth to a baby boy. Feeling there isn't enough room for her, she leaves Crow Cove hoping to over-winter with friend Rossan and help him spin his wool into yarn. Upon her arrival, though, she learns that Rossan is planning a trip to the Eastern Harbor where he hopes to sell his wool. Traveling with him, they stay with Rossan's sister in town. But a sudden sickness leaves Rossan unable to complete his duties. Eidi steps in to sell his wool and takes on some weaving with a rich man in town named Bandon, while Rossan recovers. It is at his house that she encounters a mistreated boy named Tink. Gradually, she learns of Bandon's heartache, and of Tink's, and makes a decision that affects them all. Recommended for grades 4-6. The sparse text makes this attractive to reluctant readers, but the depth of the story will interest those who enjoy historical tales or those set in small communities with family ties and seemingly uncomplicated lives. This is a wonderfully sweet story set in Texas in 1899. Eleven-year-old Calpurnia Tate is not interested in sewing, knitting, cooking, or playing piano. But she is interested in science. After her oldest of six brothers gives her a notebook, Calpurnia writes down observations and questions she has. Why the big yellow grasshoppers were living while all the small green grasshoppers seemed to be dying, is the first question she considers and the one that leads to a special bond with her grandfather. No one else dared to enter his laboratory. But Grandaddy seems pleased with her interest and begins to fill in the gaping holes that are becoming obvious in her education. Things like Darwins' theories about evolution. 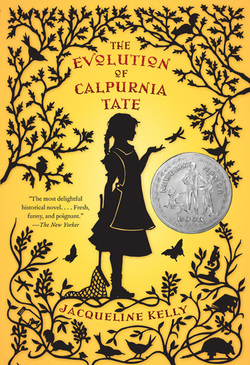 Against a backdrop of the arrival of the new century, including the likes of seeing an automobile, and the location of a telephone in their town, Calpurnia's joint discovery of a new plant species with her grandfather looms large as she questions her role in society. 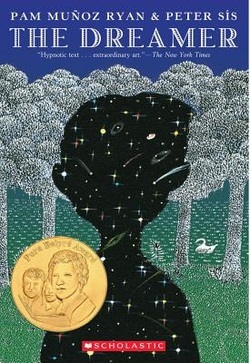 This book recently was a recipient of a 2010 Newbery Honor Award. Highly recommended for readers in grades 4 and up. This was hard to put down. 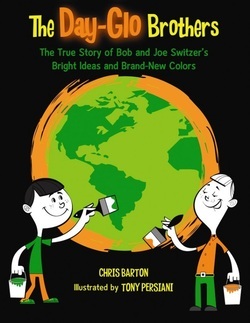 With the subtitle, "The True Story of Bob and Joe Switzer's Bright Ideas and Brand-New Colors", the reader quickly realizes what this book is about. The use of the eye-popping fluorescent colors on the cover doesn't hurt either. This very short, but very entertaining non-fiction picture book tells of the two brothers' invention of those glowing colors - orange, yellow, and green that have become commonplace today. Growing up, Bob wanted to be a doctor and Joe wanted to be a magician. Interesting that these two career paths would lead to the discovery of glow-in-the-dark colors, but the combination of Bob's involvement in an accident that left him recovering in a darkened basement, and Joe's desire to spice up his magic act with something called fluorescence, they built their own ultraviolet lamp. With this lamp they could detect substances that glowed in the dark. They experimented with these substances and soon had a paint that would glow in the dark. Unfortunately, it didn't glow in the light, and that was their next challenge. By accident, while providing fluorescent posters and billboards for customers, they invented colors that glowed both at daytime and nighttime. New uses for these colors quickly became apparent in items like buoys, guiding planes at night into airports, as distress signals on the sea, and then in more ordinary products like magazine covers, construction cones, hunting vests, and even paintings. This interesting biography has a high vocabulary reaching into sixth grade, but will appeal to readers as young as 6, if read aloud. Additional information on fluorescence is provided at the back of the book. This would be useful in units on inventions. A nice touch was the use of black and white illustrations for the period prior to the use of fluorescent colors, with increasing brightness as discoveries are made, until the last pages where everything pops off the page with glowing colors. This was a fascinating story about a little-known discovery, and adults who remember when these colors did not exist, and even those who do, will find it interesting as well. When the pharaoh Cheops died, his pyramid was complete and filled with everything he would need in his afterlife. What he did not have was a boat to provide safe passage there. Two boats were ordered to be built by Cheops' son, the first to "guide Cheops safely through the dark, perilous underworld of night, and the other to carry him up across the sky to embark on his eternal journey with the sun". This brief book in picture book form is two stories in one. The first involves the creation of the two boats for Cheops by expert Egyptian shipbuilders. The detailed description of the unique techniques used at the time are truly fascinating, not to mention the lengths gone to disassemble the ships and carefully place them in boat pits next to the pyramid where they were preserved for literally thousands of years. The second story involves the discovery of the boats and the challenge of Ahmed Youssef Moustafa, a restoration expert for the Egyptian Antiquities Service, to fit all the pieces together again without any instructions. It took years to solve this puzzle, and even more to build and reassemble the boats multiple times to ensure that they were built correctly. I remember loving anything to do with Egypt while in 6th grade, and this probably hasn't changed much with children today. This book will attract students and teachers alike. End papers and a double-page spread of the completed boat ensure lots of visual interest, and the information is substantial for such a thin book. 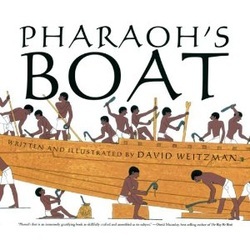 It's also interesting to note the the illustrations for the story of the boat being built are drawn in the traditional flat hieroglyphic style, while the illustrations for the discovery of the boats in modern times are more three dimentional. This has a very high vocabulary level due to the unusual Egyptian names, but the illustrations will be enough to coax younger readers to check this out. Recommended for readers in grades 5 and up. A new twist is taken in this book about Abraham Lincoln. 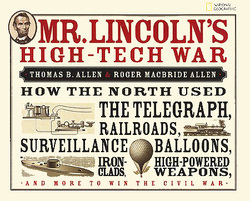 Readers follow the Civil War as new inventions are introduced, including the telegraph, railroads, surveillance balloons, iron-clads and submarines, and high-powered weapons. Accompanied by period photographs, cartoons and illustrations, each new development is explained with references to President Lincoln's involvement in its deployment during the war. One of my favorite things about this fascinating book was realizing how much President Lincoln understood all aspects of the war and that he was an early "techie". He caught on to the new technologies much faster than many of his army leaders and understood how they would help armies fight wars differently. It is interesting to note that the generals and other war leaders fighting on both sides attended West Point together, and all studied Napoleon's war tactics. Consequently, they fought battles the same way. However, with the addition of these "modern" gadgets, they were forced to adapt to new strategies - some with more resistance than others. It will be a rare child that will pick up this text-heavy book and read it cover-to-cover, but one interested in the Civil War, or war strategy, or inventions, or President Lincoln will enjoy this immensely. Named 2010 Notable Book for Older Readers as well as other honors and awards including a 2009 Top 10 book in Science & Technology. Recommended for grades 5 and up. This picture book biography of Eleanor Roosevelt is chock-full of important information about the woman who would become First Lady. Eleanor grew up in a wealthy but unloving household as a shy and unhappy girl, but her world was turned upside-down when she was sent to England to study with a teacher who encouraged her to think for herself. Her marriage to Franklin Roosevelt was a happy one, and it was at the time that she began her own political activities - teaching history and government, giving public speeches, and encouraging women to vote and participate in politics. Her activities increased as First Lady - visiting unemployed workers during the Great Depression, speaking out against segregation, and visiting soldiers fighting in WWII. She was an humanitarian with strong beliefs that others were not always happy to hear. But she never stayed quiet. After her husband died, she went on to work at the United Nations and continued to speak out on subjects in which she believed. It's a strong testament to the achievements of women in politics and introduces a wonderful role-model to young children. The sparse text makes this easy-to-read, although the vocabulary reaches a fourth-grade level. 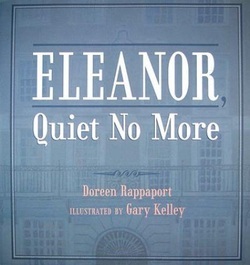 The accompanying illustrations by Gary Kelley show everything the text does not, and each of Eleanor's quotes added on each 2-page spread perfectly complement the topic being discussed. A timeline is included at the end of the book along with additional sources and web sites for further study. Highly recommended for Women's History Month, biography reports, and anyone looking for a strong female role-model. With sparse text and beautiful illustrations, this picture book provides an excellent introduction to the moon landing. Beginning with the three astronauts being clicked into their space outfits and squeezed into their seats high above the rocket, until they land again with a splash, the now familiar journey to the moon and back is explained while a family on earth watches in front of their television set. The large format also provides details about the rocket design and separation of the stages, as well as the entry and quarantine of the astronauts inside the front cover. Inside the back cover is detailed information of President Kennedy's goal to land a man on the moon and return him safely to earth, and the work by engineers to make this happen. This was awarded a 2010 Sibert Award Honor for best information book, among numerous other honors and awards. Highly recommended for kids ages 5 and up. This would also be good to read aloud, and shouldn't be missed. 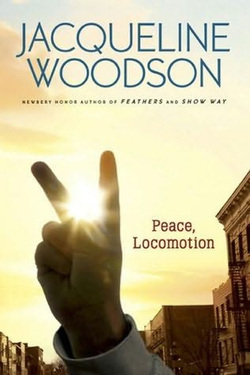 This is the sequel to Locomotion, continuing the story of Lonnie Collins Motion, but unlike the first book which was written in poems, this one uses letters written by Lonnie to his sister Lili who lives with a different foster family. He's decided that he will write as much as he can about the time before they are able to live together again, as the "rememberer" as Lili called it. One reason for the lack of poems is because his new 6th-grade teacher has told Lonnie that he is not a poet until he has something published. These words not only effect his poetry writing, but his overall school grades as well. But when another teacher takes over for his pregnant teacher, he is once again encouraged to write his poetry. As a backdrop to Lonnie's school troubles, where he is terrible at math, the story of Miss Edna's son Jenkins is brought to the forefront. He has been fighting in a war and is missing. Lonnie thinks a lot about peace and begins to end his letters to his sister with "Peace, Locomotion". Also, Miss Edna's other son, who returned home at the end of Locomotion,is back and studying to become a teacher which makes Lonnie laugh because Miss Edna has told him stories about how bad Rodney was in school as a child. He provides wise words to Lonnie, though, about how kids are really smart but sometimes don't know that they are. A lot of tough issues, including the recovery of Jenkins who has lost a leg, how Lonnie fits into his changing foster family, and the fact that Lili is now calling her foster mother "Mom" are covered in very few words. This book is excellent on CD and won a 2010 Odyssey Honor for recorded books. Highly recommended for grades 4-6. 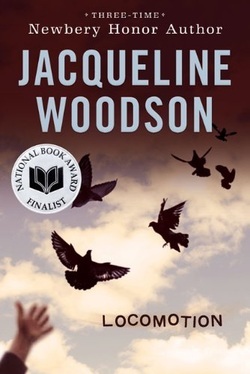 This biography just won the 2010 Coretta Scott King Award which goes to an African American author for a distinguished book about the African American experience. 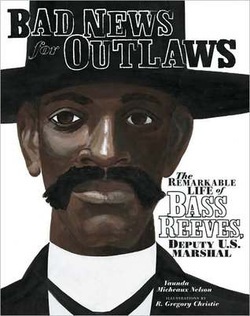 Although born a slave, Bass Reaves became the first Deputy U.S. Marshal west of the Mississippi River and gained a reputation as a brave and respected lawman during his 30 years of catching outlaws in the Indian Territories. He was feared by outlaws because he always found a way to capture the ones on his list. He was clever (often using disguises), he was a sharp-shooter, and he couldn't be bribed. And although he captured over 3000 men and women during his career, he only killed fourteen men, while never getting wounded himself. Though this is in picture book format with only 32 pages, sparse text, and illustrations by Coretta Scott King Honoree R. Gregory Christie, this book is full of interesting information and high vocabulary suitable for readers through grade 6. This is also a good choice for reluctant readers. Highly recommended as a read-aloud during Black History month as well as for supplemental information for biography reports. Additional information provided at the back includes Western words, websites and books for further reading, and a timeline for Bass Reaves. "This whole book's a poem 'cause every time I try to tell the whole story my mind goes Be quiet!" In just 100 pages, this collection of poems tells the story of fifth grader Lonnie Collins Motion (Locomotion) following the death of his parents in a fire. His teacher, Ms. Marcus, has the class write poetry and it is through this that Lonnie is able to grieve and talk about the situations troubling him. For instance, he and his younger sister, Lily, have been separated, and he misses her very much. And though she has been adopted, Lonnie lives in a foster home with Miss Edna who has two grown sons, and he isn't sure he likes her. He talks about a new kid at school who is from the country. He expresses his feelings when a classmate goes to the hospital for sickle cell anemia. And the love he feels for his little sister is unmistakable as he devises a way to spend time with her. This would be especially recommended for inner-city kids who could identify with the environment portrayed, but it is good for reluctant readers too due to the low word count. Though geared towards grades 4-6, older readers will appreciate the various types of poetry presented as well. This title won a Coretta Scott King Honor in 2004. Written originally in Danish, this is the first book in the Children of the Cove series. A young girl is left orphaned in a cove by the sea when her grandmother dies. With only a house next door with a hole in its roof, and another with only a foundation, there is no one else left where she lives, so she leaves and walks for days until she comes upon a small hamlet with a dozen or so houses farther down the coast. Quickly the girl finds work with an old woman who calls her Crow-Girl due to her resemblance to the bird. Crow-Girl collects driftwood, cooks, and cleans in exchange for her hammock in the attack and food, but all is not as it seems in the house. She discovers the woman's father living in a room on the other end of the house with no fire and very little food. And she also overhears the woman tell her husband of a plot to take advantage of her. Sensing only trouble, Crow-Girl escapes during the night and travels farther away. The heart of the story is the people Crow-Girl gathers along the way - others like her without family or homes - who help each other out with what little they have. As they return to Crow-Girl's house by the sea the reader is left with hope that this mish-mash of people will be able to survive and form a new family or community together. Highly recommended for readers in grades 4-6 who enjoy quiet adventures with a fairy tale flavor, full of details from unspecified times past.